August 31, 2009: Magnetic reconnection could be the Universe's favorite way to make things explode. It operates anywhere magnetic fields pervade space--which is to say almost everywhere. On the sun magnetic reconnection causes solar flares as powerful as a billion atomic bombs. In Earth's atmosphere, it fuels magnetic storms and auroras. In laboratories, it can cause big problems in fusion reactors. It's ubiquitous. The basics are clear enough. Magnetic lines of force cross, cancel, reconnect and—Bang! Magnetic energy is unleashed in the form of heat and charged-particle kinetic energy. But how? How does the simple act of crisscrossing magnetic field lines trigger such a ferocious explosion? "Something very interesting and fundamental is going on that we don't really understand -- not from laboratory experiments or from simulations," says Melvyn Goldstein, chief of the Geospace Physics Laboratory at NASA's Goddard Space Flight Center. NASA is going to launch a mission to get to the bottom of the mystery. It's called MMS, short for Magnetospheric Multiscale Mission, and it consists of four spacecraft which will fly through Earth's magnetosphere to study reconnection in action. The mission passed its preliminary design review in May 2009 and was approved for implementation in June 2009. Engineers can now start building the spacecraft. "Earth's magnetosphere is a wonderful natural laboratory for studying reconnection," says mission scientist Jim Burch of the Southwest Research Institute. "It is big, roomy, and reconnection is taking place there almost non-stop." In the outer layers of the magnetosphere, where Earth's magnetic field meets the solar wind, reconnection events create temporary magnetic "portals" connecting Earth to the sun. Inside the magnetosphere, in a long drawn-out structure called "the magnetotail," reconnection propels high-energy plasma clouds toward Earth, triggering Northern Lights when they hit. There are many other examples, and MMS will explore them all. The four spacecraft will be built at the Goddard Space Flight Center. "Each observatory is shaped like a giant hockey puck, about 12 feet in diameter and 4 feet in height," says Karen Halterman, MMS Project Manager at Goddard. The mission's sensors for monitoring electromagnetic fields and charged particles are being built at a number of universities and laboratories around the country, led by the Southwest Research Institute. When the instruments are done, they will be integrated into the spacecraft frames at Goddard. Launch is scheduled for 2014 onboard an Atlas V rocket. Any new physics MMS learns could ultimately help alleviate the energy crisis on Earth. "For many years, researchers have looked to fusion as a clean and abundant source of energy for our planet," says Burch. "One approach, magnetic confinement fusion, has yielded very promising results with devices such as tokamaks. But there have been problems keeping the plasma (hot ionized gas) contained in the chamber." "One of the main problems is magnetic reconnection," he continues. "A spectacular and even dangerous result of reconnection is known as the sawtooth crash. 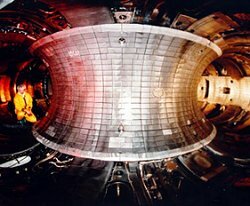 As the heat in the tokamak builds up, the electron temperature reaches a peak and then 'crashes' to a lower value, and some of the hot plasma escapes. This is caused by reconnection of the containment field." In light of this, you might suppose that tokamaks would be a good place to study reconnection. But no, says Burch. Reconnection in a tokamak happens in such a tiny volume, only a few millimeters wide, that it is very difficult to study. It is practically impossible to build sensors small enough to probe the reconnection zone. Earth's magnetosphere is much better. In the expansive magnetic bubble that surrounds our planet, the process plays out over volumes as large as tens of kilometers across. "We can fly spacecraft in and around it and get a good look at what's going on," he says. That is what MMS will do: fly directly into the reconnection zone. 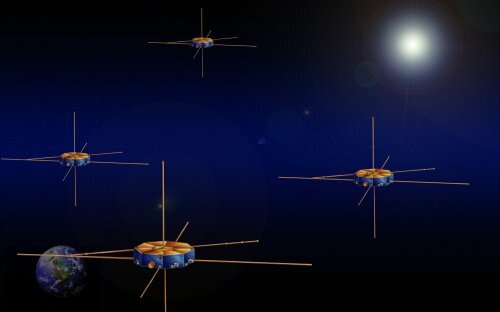 The spacecraft are sturdy enough to withstand the energetics of reconnection events known to occur in Earth's magnetosphere, so there is nothing standing in the way of a full two year mission of discovery. Learn more about the mission at the MMS Home Page.